Our product range includes a wide range of electroless nickel plating and non stick coatings. We are engaged in providing Electroless Nickel Plating services to our preferred customers, using proven methodology. In the process, we render nickel plating services on varieties of metal surfaces as per the details asked by our customers. We render the specified solution in accordance with the industry parameters and thus, assure our customers effective results in the end. 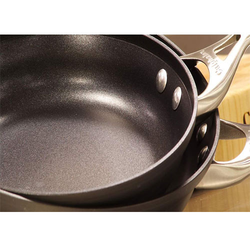 We are among the eminent names of the industry that involve in manufacturing, exporting and supplying Non Stick Coating . Massively applied on shafts, vessels, tank rollers and rods, these coatings are highly used due to the prevention of atmospheric corrosion or corrosion caused by chemicals. Our precious clients can acquire the range at affordable rates. PTFE or Poly Tetra Fluoro Ethylene is a synthetic fluoropolymer which is used in various non-stick coating applications. In case of coatings the choice of non stick coating is made from taking into consideration how different fluoropolymers react in different applications. Thin coating of Industrial non stick range embraces a diversity of applications including long lasting coatings For release of Rubbers & Plastic moulds, Heat Sealing Blades, Sweet Moulds Toffee Cutters, Hoppers, Chutes in Pharmaceuticals, Packaging, Food & Bakery Industry.